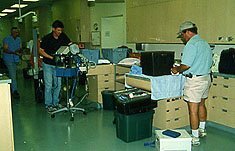 The Colyer Veterinary Medical Response Team prepares to assemble their comprehensive mobile equipment package in a large Veterinary Hospital in Tustin, California. 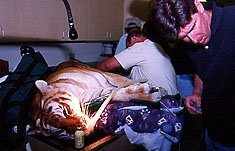 The patient, a large, female Bengal Tiger with an unusual color variant is prepared for intubation anesthesia. 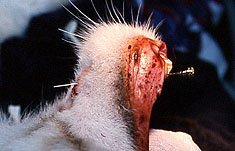 Although both mandibular canine teeth had lost their clinical crowns, the compound fractured left canine tooth had loose fragments below the gingival crest. 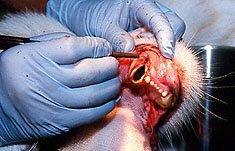 This always requires a local gingivectomy to remove the fractured plate of tooth structure to the depth of the fracture with contouring of the gingival tissue. 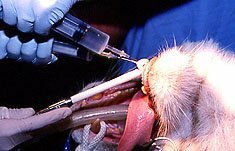 The severely infected left canine abscess intended completely through the body of the mandible to drain under the animal’s chin. 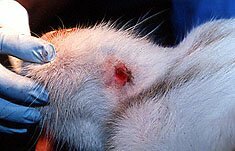 Notice the protruding metal depth probe. Restoring the apical portion of the tooth with a bioglass synthetic particulate bone grafting material. A view of the restored canine teeth. 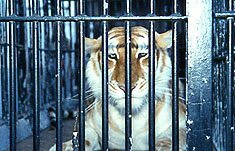 Patient recovering from anesthesia in a large transport cage.